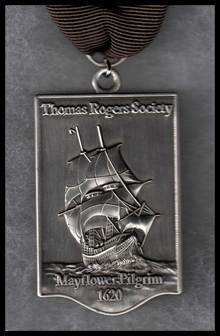 Thomas Rogers Society Regalia available for our members only. #2 Medal, miniature, approximately 1” x .625” x .060” overall, custom shape with modeled ship in the center, raised border and lettering, loop at top and unsoldered jump ring attached to a ¾” grosgrain ribbon on ribbon bar, plastic box with foam insert. Antique Silver plated over bronze - $30.00 each. #3 Charm, approximately 1” x .625” x .060” overall, custom shape with modeled ship in the center, raised border and lettering, loop at top and unsoldered jump ring attached, plastic box with foam insert. Antique Silver plated over bronze - $25.00 each.